Grant, we pray, almighty God, that we, who have come to know the grace of the Lord's Resurrection, may through the love of the Spirit, ourselves rise to newness of life. Through our Lord Jesus Christ, your Son, who lives and reigns with you in the unity of the Holy Spirit, one God, for ever and ever. Today the Church in Canada celebrates the feast of Our Lady of Montserrat. Monserrat is located in the region of Catalonia in Spain. Legend relates that the original sculpture was carved by St. Luke and brought to Montserrat by St. Peter in 50 A.D. St. Ignatius of Loyola, a former Crusader, decided to become a missionary after having prayed before this image of Mary. According to the 1962 Missal of Bl. John XXIII the Extraordinary Form of the Roman Rite, today is the feast of St. Peter Canisius. His feast in the Ordinary Form of the Roman Rite is celebrated on December 21. It is also the feast of St. Zita of Lucca, a virgin who died in 1278. The origin of the devotion to Our Lady at the shrine of Montserrat according to the earliest written records dates from 932, when the Count of Barcelona confirmed and renewed an endowment to the shrine made by his father in 888. This gift was again confirmed in 982 by Lothaire, King of France. Constant and unbroken tradition is that even previous to 888, an image of Our Lady was miraculously found among the rocks of Montserrat. Montserrat itself is a fantastic mountain group, four thousand feet high, about twenty miles from Barcelona. The name, Montserrat, of Latin origin, means saw-edged mountain. It is formed by huge boulders that raise their immense bulk perpendicularly to that four thousand foot summit. Outwardly, it resembles the seemingly inaccessible monasteries seen on high Mount Athos in Greece: "Montserrat is, and will forever be, a source of deep impressions caused by the singularity of the place. There, what is material becomes cyclopean, the mysterious is turned mystical and the picturesque is promoted to sublimity." There is a story that the mountain was once a huge boulder with a smooth surface. At the time of the Crucifixion of Jesus, however, when the sun darkened, the rock was shaken to its very foundations and when light returned, the mountain had a thousand peaks. The legend relates that the figure of Our Lady came from Jerusalem to Barcelona, and was brought into the mountains to save it from the Saracens. It is true that the Montserrat statue has oriental features, but this could well be traced to the Byzantine sculptors who were constantly employed in the West. The legend goes on to say that in the eighth century shepherds one night saw strange lights on the mountain and heard Seraphic music. Guided by the shepherds, the Bishop of Manresa found, in a cavern, a wooden figure of Our Lady and the Holy Child. He ordered that the statue be carried into the cathedral immediately. However, the procession with the statue never reached the cathedral because, after much marching, the small wooden figure became too heavy so that the Bishop decided to accept it as a sign and left it in a chapel of a nearby hermitage. The statue remained there until a church was built on the site of the present abbey on the top of the rocks near where the statue was discovered. Since that incident, this statue is the most celebrated, the most important of Spain; it is thirty-eight inches in height, and is known as "La Morenata" — The Little Black Madonna. The wood is now black with age; one of its most striking features is the dignified expression of Our Lady. In her right hand, she holds a majestic orb. Visit this website to view some pictures of the Shrine of Our Lady of Montserrat. 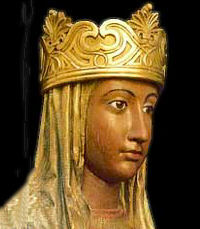 Read more about the statue of Our Lady of Montserrat. Read more about how the people of Catalonia celebrate this feast at Catalan News Agency. Listen to the beautiful hymn, Virolai, composed in Our Lady's honor, sung by the legendary boys choir of the Benedictine Abbey of Our Lady atop the mountain of Montserrat. Enjoy viewing a virtual tour of Montserrat at the Abadia de Montserrat. Read about Saint Josemaria and Our Lady of Montserrat. St. Zita spent her life from age 12 until her death at age 60 as a servant in the household of the Sagrati family. Zita had been born into a devout family, and when she was a child, she would respond with instant obedience when her mother would say either, "This is pleasing to God" or "That would displease God." As a servant, Zita was an excellent worker. Both the household and the Sagrati children were committed to her care. Zita believed that "A servant is not pious if she is not industrious; work-shy piety in people of our position is sham piety." Zita was also a great friend to the poor, giving away her food and contenting herself with scraps. For years she had to suffer hostility from the other domestics, but on several occasions her goodness was miraculously recognized. One morning, when she had inadvertently over-stayed in church praying until sunrise, she hurried home to find the bread dough already prepared for the oven. Zita's last years were spent in the esteem of the household and engaged in contemplation and charity. She was especially devoted to prisoners awaiting execution, and she spent hours praying for them. St. Zita died very peacefully while at prayer. Bake a loaf of bread today in honor of St. Zita, the Little Cook.